India's success in bringing down the bilateral trade deficit was built partly on opportunities brought by an ongoing trade war between China and the US and partly from its involvement in the Regional Comprehensive Economic Partnership (RCEP), a Bloomberg report said on Tuesday. During the conflict, China cut many imports from the US and looked for substitutes elsewhere, indirectly benefiting India in areas including agricultural products like soybeans. Now that the trade war seems to be approaching its end, analysts said that India must do more things to maintain this rebalancing trend. 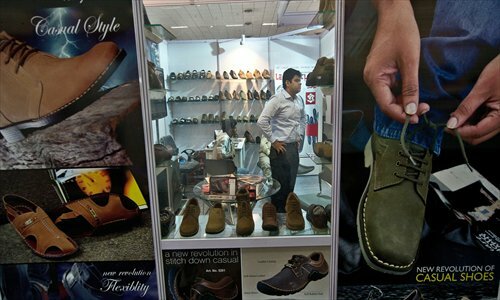 Indian exports to China jumped 31 percent year-on-year to $17 billion in the fiscal year ended on March 31, Bloomberg reported on Tuesday, citing unidentified sources. In the process, it cut the bilateral trade deficit by $10 billion to $53 billion, the best result in more than a decade. The trade gap has long been a closely watched issue in India. The Economic Times reported on Monday that Indian trade watchers cheered the news, while Indian Commerce Minister Suresh Prabhu put out a celebratory tweet on the "whopping, unprecedented reduction" in India's trade deficit with China. "The Chinese and the Indian government have been making efforts to rectify the imbalance [between China and India]," Swaran Singh, an Asian expert at Jawaharlal Nehru University in New Delhi, told the Global Times on Wednesday. Singh argued that addressing the trade imbalance is also in China's interest. However, Zhao Ping, the director of the international trade department at the China Council for the Promotion of International Trade, said India must make solid progress in three aspects to sustain the rebalancing. The comments reflected some of the controversial reaction India has had toward Chinese products and India's mercantilist approach. Some Indian associations recently set Chinese goods on fire and the country is one of the most active in launching antidumping probes against China. "India should be more friendly in trade facilitation with China. It must also come to the understanding that opening up is a mutual act and free trade does not necessarily widen its trade gap with China," Zhao told the Global Times. "Free trade can also reduce India's trade gap with China." "China is the world's second-largest consumer market, and it's in the process of ramping up imports from around the world and slashing tariffs for imported products," Zhao said. More active participation in the RCEP will mean wider access for Indian goods in the Chinese market, Zhao said. However, Zhao said as China is opening up to every country that's eyeing its markets, India must ramp up the competitiveness of its products. "It is not a matter of whether China opens up to India. It is a matter of whether Indian goods can compete with other countries' products that are also flooding into the Chinese market," Zhao said. An enormous increase in China's investment in India is proving to be one successful strategy to redress it, Singh said. More Chinese companies are now manufacturing in India to sell directly to the local market. India's overall exports including merchandise and services during the fiscal year were estimated at $535.45 billion, exhibiting a gain of 7.97 percent year-on-year, according to data from the Indian Ministry of Commerce & Industry on Monday.